Pizza is always a good idea in my book, especially to kick-off a night out (or after an intense hike), and from start to finish I absolutely loved Marco’s Pizza. 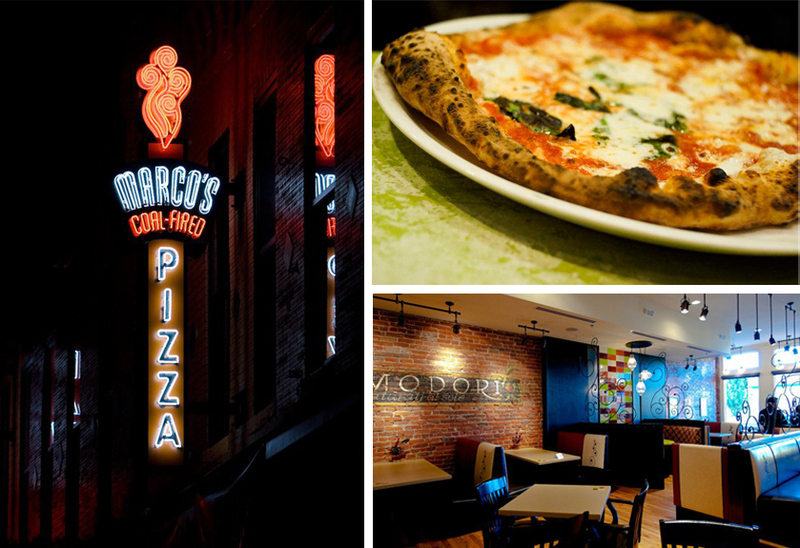 Located on Larimer Street near Coors field, the restaurant serves up authentic Neapolitan-style pizza, and variety of both Italian and New York-inspired toppings, it’s difficult to pick just one. Luckily I came with a group so we ordered 4 different pizzas, my favorite being the Toscana with fresh mozzarella, San Marzano tomato sauce, Prosciutto di Parma and grape tomatoes, topped with fresh arugula. You can also customize your own pizza, but with so many enticing combinations already on the menu, you probably won’t want to. Pair your pizza with a drink from Marco’s cocktail menu, which features delicious concoctions like the Rocktini (Acai blueberry vodka with a splash of San Pellegrino Limonata) or the Prosecco Pear Mojito (rum with muddled fresh lime, mint, pears and Prosecco). If you still have room for dessert – or have a weakness for a certain hazelnut spread – try the Nutella “stuffed” pizza in all of its gooey goodness, among other desserts options. Speaking of mojitos, when you walk into Mynt the first thing you notice is the overwhelming smell of fresh mint. 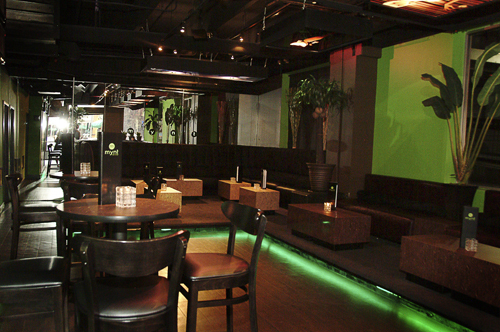 That’s because the bar specializes in ice cold mojitos, which you can order by the glass or by the pitcher. Ditch your usual cocktail and try options ranging from the classic mojito to cucumber pear or banana berry. Sit back and enjoy your drink in Mynt’s cool black and neon-green lit lounge, dance the night away when DJs take the stage at 10pm or come earlier to take advantage of the bar’s awesome happy hour specials. Just up the street from Mynt is the Tavern. Housed in a historic LoDo warehouse, the Tavern has both an indoor bar with game room and an outdoor bar on the rooftop patio overlooking Coors Field. And at 11,000 square feet, the Tavern has earned bragging rights as having “Colorado’s largest rooftop patio”. On a beautiful summer night, the patio is a great spot to hang out with friends, dance to live music or shoot a game of pool. 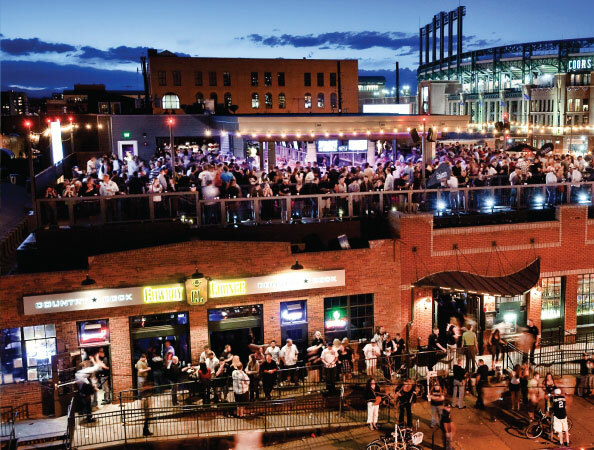 And since the Tavern steps away from Coors Field, it’s also a great place for pre- or post-Rockies game celebrations. I instantly fell in love with this breakfast place. Tucked inside the Denver Place building on 18th Street, Syrup is a modern take on the traditional pancake house. You’ll never look at plain old maple syrup the same way after trying one of the restaurants handcrafted flavored syrups. Current offerings range from strawberry to butterscotch, with the goal of having at least 30 different housemade syrups by the end of the summer, including sugar-free options. Both breakfast and lunch are served all day, but it’s easy to glance over the latter with so many decadent breakfast offerings. From a sweet stack of pancakes (smothered in fresh fruit sautéed in syrup) to savory dishes like the award-winning Cherry Creeker (Corned Beef Hashed topped with 2 poached eggs and Hollandaise sauce), there’s definitely something for everyone at Syrup. 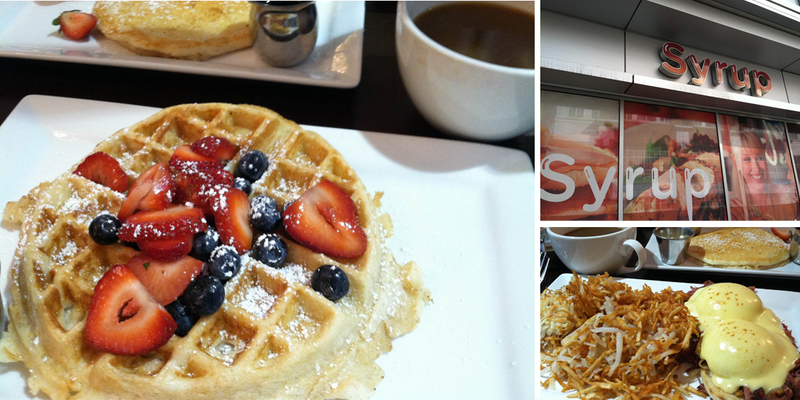 The portions are hearty, the customization is endless (can you say Pancake or Mini-Waffle Flight!?) and on the weekends, the mimosas are bottomless. I opted for the lighter Double Berry Bliss with blackberry syrup on the side, a smart move since a little of the sweet, rich stuff goes a long way. It also gave me the opportunity to try my husband’s apple cinnamon syrup. The verdict? I couldn’t decide which one I liked better. Syrup also offers an affordable, Grab-n-Go menu that you can order by “email, call head or just swing by,” and has a second location in the Cherry Creek shopping district. With its beautiful interior (a harmony of vintage and modern elements), irresistible menu and great service, Syrup has all the ingredients for the perfect weekend brunch. For more Denver EATS click here. Any places in Denver that you recommend? If so, share them below! it’s so wrong that it’s the middle of the night (here in the philippines) and reading a post about food makes me crave for everything so yummy! goodness. Haha, so sorry kattrinna! Maybe it’s inspiration for a midnight snack?! I tend to avoid lodo, too many bros for my liking, but the spot I like around there is 1up (http://www.the-1up.com) its a barcade and has so much pinball its amazing. As far as breakfast spots, Snooze (http://www.snoozeeatery.com/) and Lucile’s (http://www.luciles.com/) are killer. Snooze has champagne on tap for all your mimosa needs. Lucile’s is a creole place and the beignets and biscuits are must haves. Another pizza spot worth checking out is Hops and Pie (http://www.hopsandpie.com/) Good pizza and an extensive craft beer list. An awesome dive bar, that got pretty busy for a minute after being featured on some Food Network show is the Highland Tavern (http://www.highlandtavern.com/). House made everything from tater tots, pastrami, corned beef to pork rinds. Everything there is delicious. For vegetarian and vegan folks. Watercourse (http://www.watercoursefoods.com/) and City, O City(http://www.cityocitydenver.com/). The food is so good its worth checking out for non-veggie types. Both places do Seitan Buffalo Wings that rival real chicken wings in flavor. Also City, O City does a proper Moscow Mule served in a copper mug. Alberto – these are AWESOME suggestions, thanks for sharing them! I’ll definitely have to check out a few next time I’m in Denver.